Showing you the most relevant issues on your default filters. Our default popular filters show you the issues that are most relevant to you based on the issue's status and your role on the issue. Giving you the right issue statuses to update. When updating an issue, DoneDone only shows you the statuses that make sense depending on your role and the issue status. 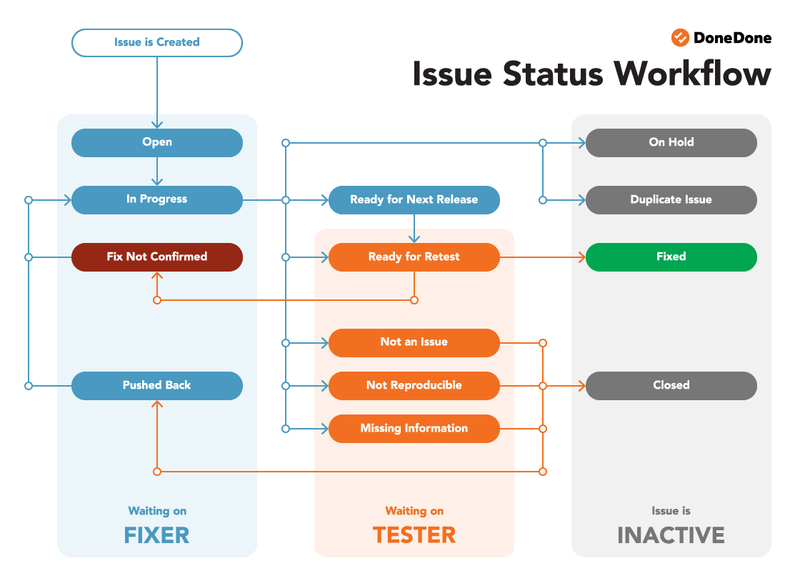 For example, if an issue is Ready for Retest, the tester can only change the status to Fixed or Not Fixed. Open The issue has been created but not yet started. In Progress The fixer has begun working on the fix. Not an Issue The fixer has determined the issue is expected or by design. Not Reproducible The fixer cannot recreate the issue as described. Missing Information The fixer needs more details in order to complete the fix. Ready For Next Release The fixer has resolved the issue and is waiting to be added to a release, a collection of issues that should all be tested at once. When a project admin creates a release build, the testers of all the issues will be notified to confirm their issues’ fixes. Ready For Retest The fixer has resolved the issue and wants the tester to confirm that the fix also works for them. Fix Not Confirmed The tester has tried the fix nbut the issue is still unresolved. Fixed The tester has tried the fix and it has correctly resolved the issue. It's DoneDone! Closed The issue should no longer be worked on. On Hold The issue will be worked on at a later time. Duplicate The issue is a duplicate of another issue. Of course, there will always be situations where you need to directly set an issue’s status, regardless of its current state in the workflow. If you're a project or account admin, you created the issue, or you are the current tester or fixer, you can use the Edit icon to change an issue’s status to any other status. If you're a project or account admin, you can use the Bulk Edit feature to change the status of multiple issues at once.